When you think of walruses, you may picture their tusks—the huge pinniped’s most familiar characteristic. But there is so much more to these “elephants of the sea”! Here are some less-obvious facts about these ice-dwelling creatures. 1. Biologists classify the walrus as a carnivore, or meat eater, which puts the animal in the same broad category as wolves, foxes and lions. 2. The polar bear, weighing as much as 1,200 pounds, is often touted as North America’s largest terrestrial carnivore. But it’s a mere wisp compared to the ocean-going male walrus, which can tip the scales in excess of 3,700 pounds. 3. Walruses depend on sea ice, and spend much of the summer on flows from which they dive into relatively shallow waters in search of food. In winter, the walruses go to shore and feed in near-shore waters. They communicate with grunting and roaring sounds. 4. Despite their size and their ability to stay underwater for up to half an hour, walruses are not deep divers—they usually feed at depths of less than 300 feet. 5. Walruses find much of their food by poking around on the ocean floor. When a walrus finds a tasty crab or clam buried in sand, it creates powerful suction with its mouth to vacuum it up. Walruses are not picky eaters—they feed mainly on mollusks, but will also eat worms, cephalopods, crustaceans and more. They even nosh on an occasional seal, though observations of walruses hunting their close relatives are rare. 6. Walruses are able to locate buried food thanks to the 400-700 stiff bristles, or vibrissae, which grow on their muzzles. Like a cat’s whiskers, vibrissae are sensitive to touch, telling the walrus when it has come in contact with an appropriate food. Vibrissae can grow up to a foot long, but scraping against sand and rock usually keeps them shorter. 7. Adult walruses have few enemies, mostly due to their massive size and sharp tusks, which can grow to more than three feet long. Bears sometimes attack young walruses, as do orcas. 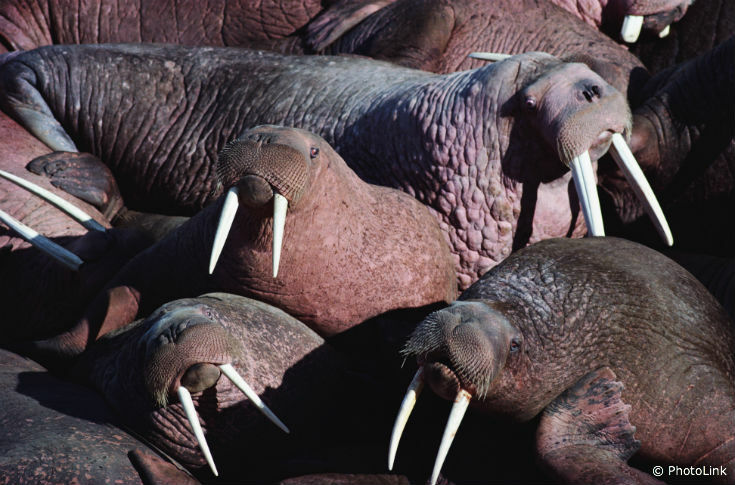 A bear attack on a beached walrus herd can make the pinnipeds rush headlong for the safety of water, causing injuries to adult walruses in the general crush and making them vulnerable to bear attacks. 8. The scientific name for the walrus genus is Odobenus, which is Greek for “tooth walker,” so-called because walruses sometimes use their tusks to haul themselves onto ice. 9. The brownish, heavily seamed skin of the walrus is over 1.5 inches thick and covers a layer of blubber that can get to 3.9 inches thick. The skin grows paler as the animals age, until the dark brown of the young fades to cinnamon in mature animals. The color depends partly on blood flow to the skin; when in cold water, blood flow to the skin reduces, so the skin of a pink walrus can turn nearly white. 10. Walruses breed from January to March while winter is in full swing, and females give birth about 16 months later. A newborn calf can weigh 100 to 165 pounds and may stay with the mother for two years or more, though usually weaned after a year. The Ocean Conservancy is using science-based solutions to tackle the biggest threats to our ocean, including ones that threaten walruses and other wildlife. See how you can take action.